Symbols*: The bear is following the pulsating rhythms of the universe. Its gait is surrounded by all-encompassing energies that include earth, air, sky, and water. All of the elements weave together in a harmonious dance to provide a feeling of wholeness and internal awakening. The roots of the earthly powers boast budding flowers and stars, symbolic of the earth’s bountiful gifts. The greenery converges into a wave of multiple energies. The pentacles possess illuminating powers. Feathers remind us that the nurturing spirit is a vital part of our well-being. We cannot necessarily enjoy material gains without having a deeper connection with our internal spirits. The bear is a powerful symbol of the cycle of life, motherhood, and protection. 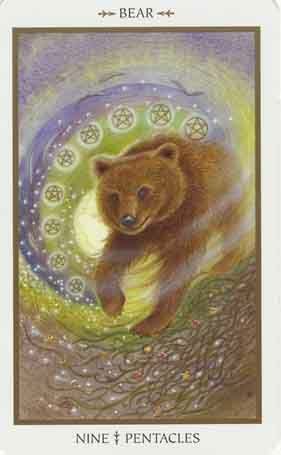 The bear helps us to harness internal energy as a means of connecting with the external powers of the physical world. Description*: The integration of the four psychic functions enables us to lead more balanced lives. By engaging in tasks that result in an overall expansion of our being, we can expect to live dynamic lives overflowing with productivity. We can become more empowered, more organized, more inventive, and more comfortable by learning how to manifest the many blessings that the elements have to offer. By establishing a strong framework for personal expansion, we can expect to flourish in all areas of our lives. But before this can be achieved, it is important to be grounded and to nurture a strong relationship with the essence of the earth element. Possible Meaning: The bear, the three birds, and the gentle wind swooshing by are reminders of the continuation of life cycles. They’re also the mediators between the spiritual and physical realm. Listen to your inner-self, your intuition. You will feel very productive at this time; you will gain multiple things. Thoughts/Points to Ponder: The bear is looking at me and smiling. There is a sparkling spiral around him, three birds are flying above. Sub/Unconscious mind, strength, grounding, inner energy of soul to find answers, inner power to taste the honey of life. The bear teaches caution, quiet of the mind and silence within. There is great power in introspection which awakens insights and opportunities. He teaches natural healing abilities, and defending when necessary. The birds are messengers, and the connection between the physical and spiritual realm.